Due to my hectic work schedule I have had a hard time trying to make my weekly grocery store trip. I had heard of Blue Apron from someone I follow on Instagram and decided to give it a shot. I signed up for the two person meal plan for $59.99 which gives you three recipes that feeds two. I was worried that I would be locked into a contract with this service but you have the ability to see the meal schedule for 4 weeks in advance and you can skip any week you do not like the menu at no additional charge. Therefore you only pay for the weeks you want to make the recipes. The meals I chose were items that I would have never put together or even bought at the grocery. I absolutely felt like a real chef once I received the items in the mail. The produce was high quality in addition to the meat as well. I only had one issue in which the swiss chard they sent me was wilted and they immediately credited my account for the meal. I liked that the recipe details had pictures in order to show how the vegetables were cut, what legumes should look like after cooked, and also what the meat or sauce should look like. Most meals are from 500-800 calories and they say most meals take 30-45 minutes to cook. On each recipe you will see the prep time and cook time separate. To me these times were based on chefs who cook for a living because I have yet to meet their suggested prep or cook time. All ingredients from each dish are included with the shipment. The only item I have found that they did not include was olive oil. They also list on their website which cooking utensils are suggested to use in order to prep and cook the meal. This has really helped me step my kitchen supply game up as well. One of the other only cons I see with this service is just selection in meal ingredients. I happen to see a lot of swiss chard and kale in my meal recipes. When you first sign up they ask what your meat preferences are but not anything for vegetables. I would like to see more diversity in the meals that are offered and also the possibility that in the future you can choose to be sent some of the old favorite recipes you previously tried. For any vegans reading this they have not included vegan meals but they do have a vegetarian option. 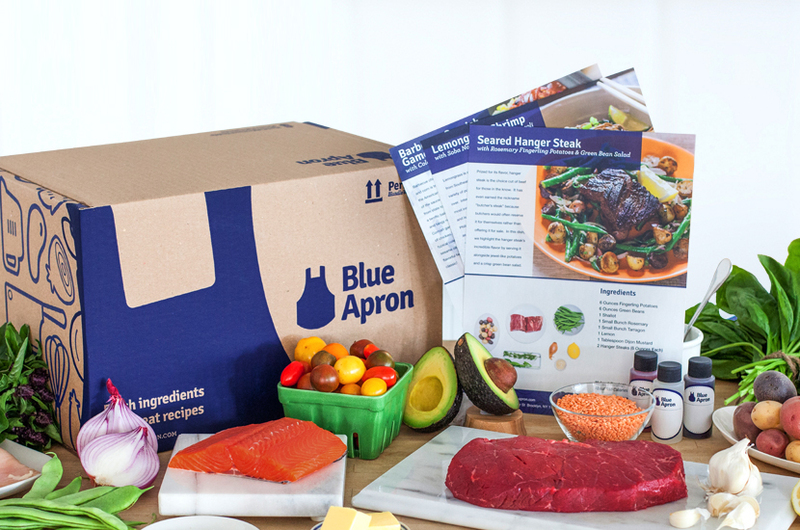 Overall I believe the Blue Apron is a great service for a great price with good quality products. Have any of you tried Blue Apron? If so please give your rating and share your experience below.